The whole village was shocked when we learned that Barclays Bank was to remove their ATM in Church Street, when the Branch itself closed (‘for commercial reasons’) on 29th March 2019. High level meetings were organised with our MP and senior representatives of the Bank to try to get the Bank to change their minds. But the 29th June proved to be an inauspicious date for anybody with the word ‘negotiate’ in their minds! It isn’t just retailers, businesses and others, particularly the elderly, who used the Bank branch on a regular basis, and who are left high and dry when it comes to meeting their normal banking needs. Just about everybody is now left with the need to make alternative arrangements to meet their need for cash. At a Parish Council meeting, one Councillor famously suggested that villagers without a car could catch a bus up London Road to the BP garage to use their ATM! No further comment is needed on that one. But some 1,184 local people signed a petition organised by Christina Raven saying that they wanted to keep an ATM, and it is on that basis that a few things are happening. The Welwyn Parish Council have agreed in principle that the only practical alternate site in Welwyn Village would be at the Civic Centre in Prospect Place, and they await the results of a special Barclays Bank survey to learn if the Bank will agree. The Parish Council also arranged for the Bank to use the Interview Room in St Mary’s Church House, on Tuesday mornings when the Hall is open for the Community Cafe, which has a regular assembly of many elderly villagers. But this is not for cash transactions. The Bank survey of the Civic Centre site can be expected to cover many aspects including access and security for Bank Staff, (who have to service the machine), and for Bank customers themselves because the site could be considered vulnerable, even though perhaps no less vulnerable than the original site in Church Street. Tesco Store in the High Street is the only other alternative option should the more favoured Civic Centre be adjudged ‘unsuitable’ either by the Parish Council or by Barclays Bank. Tesco management are still considering the prospect of using their Store, but there are clearly serious issues that they would have to address. So, in anticipation of a decision (yet to be forthcoming from Barcays) how will the Parish Council decide whether the Civic Centre site is ‘suitable’ in their eyes? The fact that 1184 villagers signed the Petition to say that they want to keep an ATM in Welwyn would seem to be a clear enough message – but the Parish Council needs to be convinced. The Welwyn Parish Council are therefore to raise the question at their Annual Parish Assembly on Wednesday evening 17th April, which starts at 7.30 pm. at the Welwyn Civic Centre. So – if you have strong views on the matter, whether or not you signed the Petition, you are encouraged to attend the Welwyn Parish Council Annual Assembly on Wednesday 17th April 2019 to voice your views. Barclays Bank’s scheduled closure will go ahead on 29th March. This is despite the Petition co-ordinated by Christina Raven, bearing 1184 signatures, which asks that the bank should stay open for a few more years. 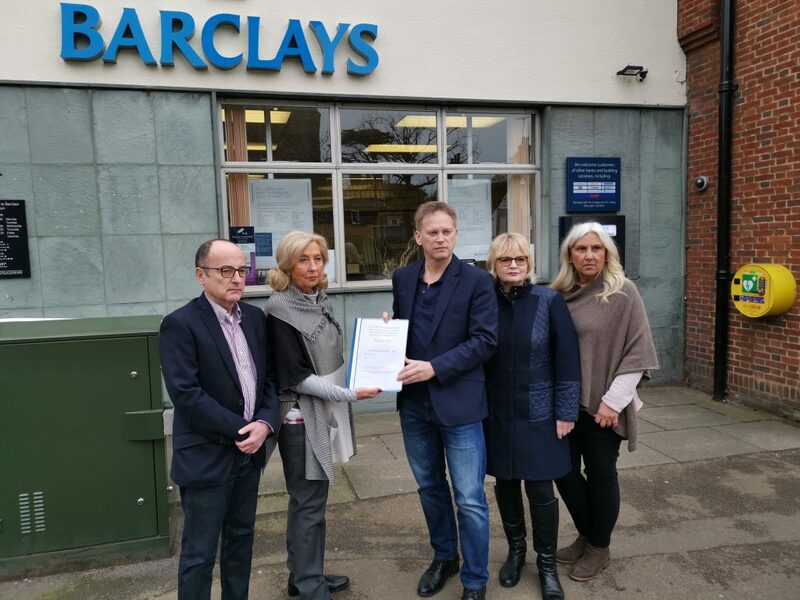 At a meeting with Barclays on Friday 8th March, Grant Shapps MP presented the petition on behalf of the community to Donna Hagan-Grenfell, Community Banking Director. Also present were Cllr Tony Kingsbury, Leader of Welwyn Hatfield Borough Council, Sandra Kyriakides for the Welwyn Planning & Amenity Group, Jane Carr for St Mary’s Church and Delene Miller, proprietor of Welwyn’s Post Office. Lisa Webb, Barclays Community Relations Officer and Dean Body, Director of Business Banking at Welwyn Garden City were also present. Grant Shapps spelled out the major issues that the closure of the Bank will create. These are of great concern to the local community and Mr Shapps asked that Barclays find ways to help the community in the short-term, until long-term solutions are implemented. Sandra Kyriakides pointed out that the nearest banks to Welwyn are either 4 miles away in Welwyn Garden City or 5 miles away in Stevenage. This can involve half a day on buses for the elderly and less able, for whom Barclays in Welwyn has been a lifeline for so many years. She also said that the defibrillator needs to be as near to its current location as possible as this is the part of the village with the highest footfall. She raised the concern of businesses that operate mainly on a cash basis and the problems they will have. Dona Hagan expressed a willingness to help on behalf of Barclays. She was unable to give definitive answers at the meeting but will be seeking approval for the suggestions made and will report back to those present at the meeting as soon as possible. The ATM machine is to be relocated to a suitable site within Welwyn Village and will be paid for and maintained by Barclays, provided they can do this without incurring a rental charge. Barclays will endeavour to keep the current machine operational until then. Grant Shapps stressed that there must be no break in availability of cash provision. The Defibrillator can remain on the wall of the Barclays Bank building until approval for the new site is finalised and Barclays will continue to supply the electrical connection. This could take some months. Barclays has agreed to cover the cost of moving and reinstalling the defibrillator. A Banking Assistance service will be provided by Barclays for as long as is appropriate to those who need help with online banking procedures. This will be of particular benefit to the older members of the community who are less mobile or unsure of technology. St Mary’s Church has offered space in Church House to run these sessions on Tuesday mornings when Community Café meets. Businesses that are Barclays customers are invited to contact Dean Body at Welwyn Garden City to discuss arrangements that may be possible for provision and collection of cash, called “Business Collect”. Dona Hagan also agreed to investigate the possibility of providing this service to the Charity Shop and Church. Although Barclays’ decision is irreversible and the loss of the bank will be difficult for Welwyn, they are at least listening to the problems that losing the bank will cause to the village and seem to be willing to help. Our thanks to Grant Shapps MP for his support and to Christina Raven for all her work putting together the Petition, which Barclays say they will acknowledge. 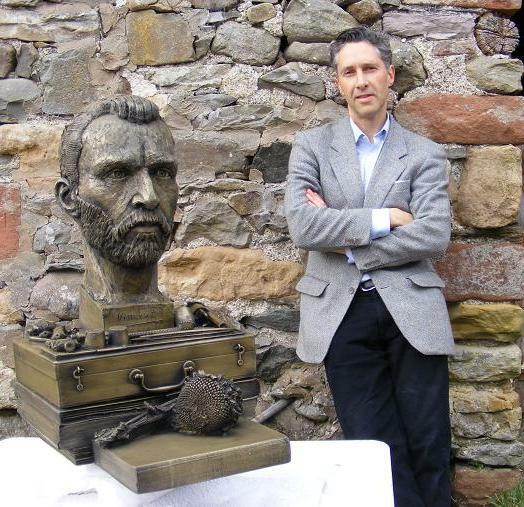 The following report has been produced by the sculptor, Anthony Padgett, who provided this photo.. In total there are 7 of the sculptures (each in England, France, Holland and Belgium. The locations were chosen after careful research into the life of Van Gogh. Welwyn (already sited) – where he walked 100 miles to visit his sister in 1876. The work coincides with a resurgance of interest in Van Gogh and the blockbuster exhibition at Tate Britain of Van Gogh’s work which will celebrate his time in England. Further to my recent post on Nextdoor, I’ve received a lot of replies complaining about pavements and pathways. I spoke with County Councillor Richard Smith today and he will be happy to help in any way he can. He also suggests that you go onto the Herts CC website: ku.vo1555687748g.ccs1555687748treh@1555687748tceri1555687748dstre1555687748h1555687748 and lodge your complaint, or phone them on 0300 123 4047. The Welwyn Planning & Amenity Group is compiling a list of pavements and pathways in our Parish that are in need of repair/attention. You can help by letting me know if there are any such issues in your area. We hope to then bring the matter to the attention of the appropriate local authorities and will do all we can to get action where it is needed. The Community Cafe makes a surplus each year. The surplus has grown slightly over the years even though the cost of coffee, biscuits and teacakes has increased. This is because, as the message gets around, more people come here on Tuesday and also because increasingly people come back for second helpings! The surplus this year was a little over £1200, this is divided between the PCC who provide the facility and the Parish Plan. The Parish Plan share goes towards the projects we run. Go to the Parish Plan Group for more information about the background to the formation of the Community Cafe, and a fuller report for 2018.